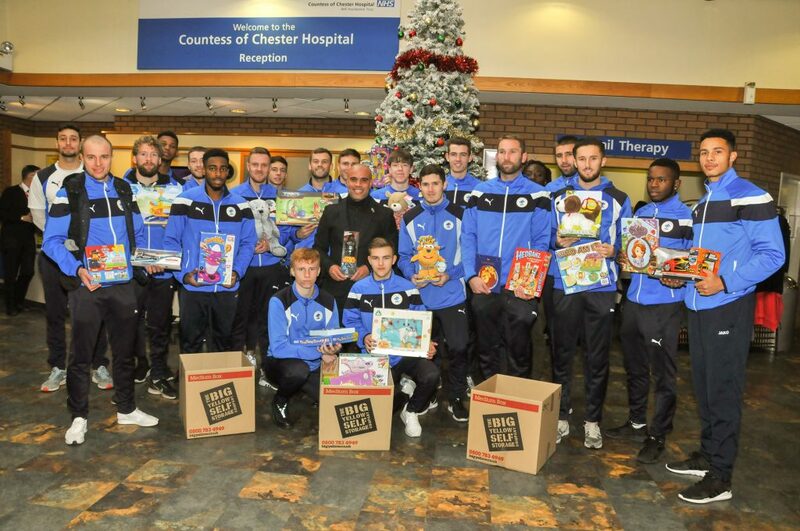 Chester FC players and staff visited the Countess of Chester Hospital to deliver presents to the Children’s Ward in time for Christmas. The presents come courtesy of donations from supporters to the Big Yellow Self Storage Christmas Toy Appeal. It is the third year the Blues have supported the appeal and it gets bigger and better every year. The entire first-team squad – along with Manager Marcus Bignot and CEO Mark Maguire – attended. 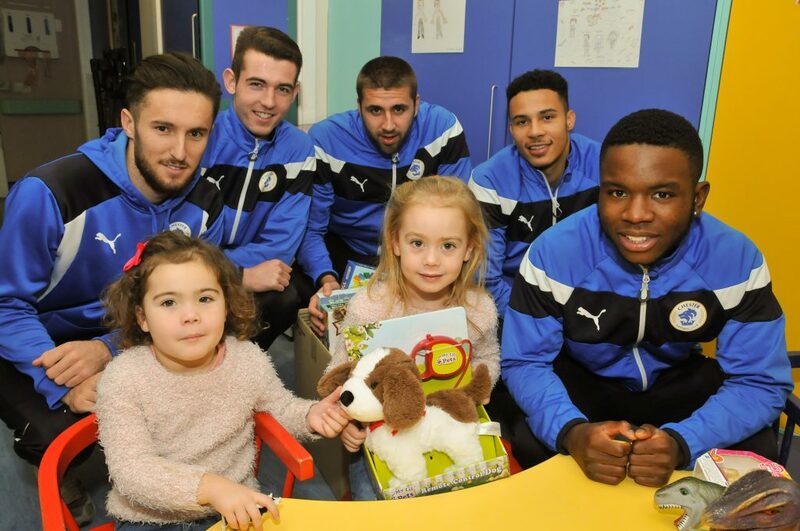 Then, staff along with Lucas Dawson, James Jones, Ryan Astles, James Akintunde and Jordan Archer went across to the Ward to see some of the young children and present them with gifts. Jeff Banks, of Big Yellow Self Storage, said: “We’ve been able to take many of the donations to the Children’s Ward at the Countess of Chester Hospital. Manager Marcus Bignot said: “I know how much it means to the children. “At Christmas time it hits home – it’s not nice to see young children ill; but especially at this special time of year. We just really hope we’ve played a small part in making their day and putting smiles on faces. Jim Green, chief executive of Chester FC Community Trust, added: “It is never nice to see young children in hospital but it’s particularly difficult at Christmas. 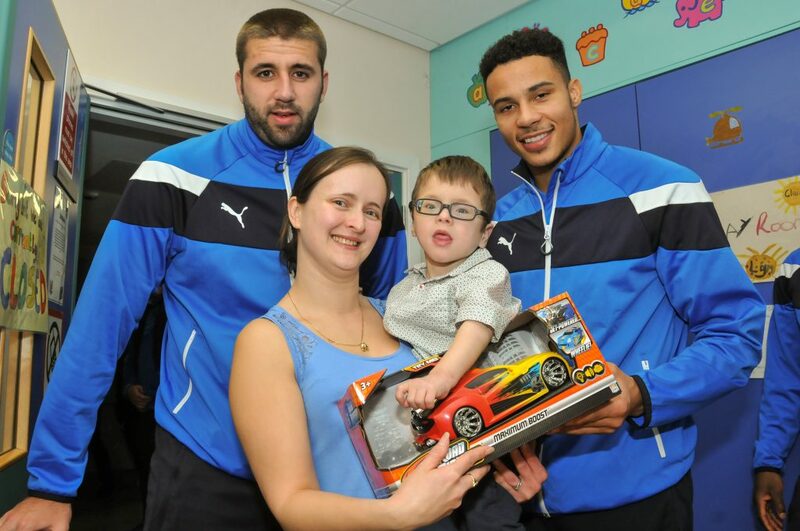 “We’re very grateful to the hospital for allowing us to make this visit. It’s something we place a lot of importance on and hopefully brings a little festive cheer to children and their families at a tough time. “The players’ visit is a little bit of relief for the kids and they spent time chatting with them, handing out gifts and having photographs. Charities benefiting from the donations include The Countess Charity, Save the Family, Children’s Services, Local Solutions, Cheshire Buddies and Age UK. To date, with further donations still to come in, £5,000 worth of new toys and gifts have been donated to the appeal. We’re excited to reveal details of the Junior Blues Christmas Party! This year’s party will be a Festive Funday and is being held on Thursday 28th December between 10am and 2pm at the Swansway Chester Stadium. The event is free of charge for Junior Blues members with children who are not currently members able to sign up for £5. You will have the chance to watch the first team train and then meet the whole squad for autographs and photos with the likes of Ryan Astles, Ross Hannah, Lucas Dawson and James Akintunde. There is lots of festive fun planned including football and sport activities, music, quizzes, crafts and games. Lunch and drinks will be provided for Junior Blues and club mascot Lupus will be making a special visit to join the fun too. Fans are advised to book now as places must be requested in advance. Parents can drop children off at the Blues Bar for 10am and collect them at 2pm following the party. 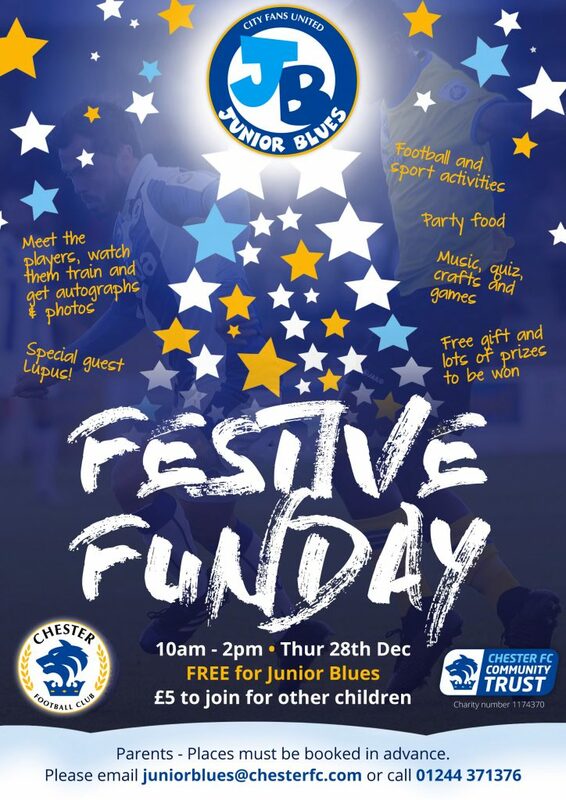 To book, email juniorblues@chesterfc.com or contact the ticket office on 01244 371376. City Fans United and Chester FC Community Trust are pleased to announce a new pilot initiative to improve the matchday experience for supporters. Beginning with this weekend’s game against Solihull Moors, Chester FC Games Makers will be on hand to welcome home and visiting fans to the Swansway Chester Stadium. 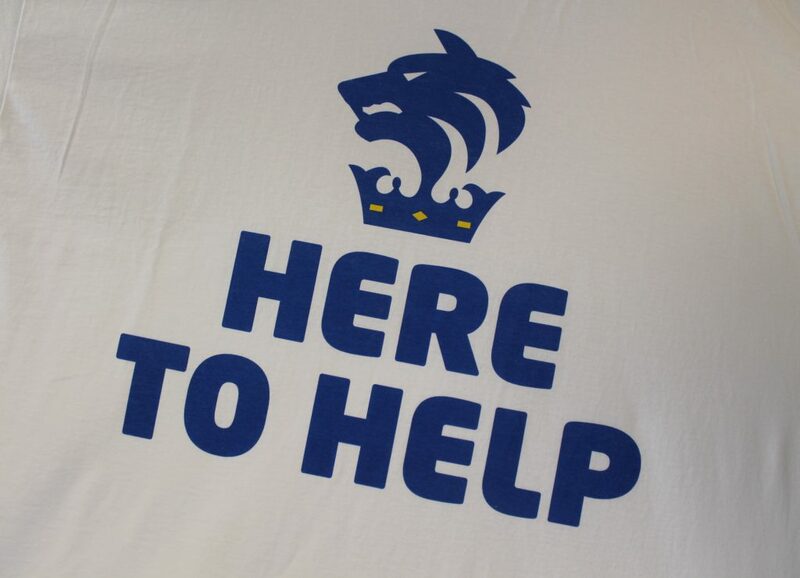 Sporting distinct t-shirts featuring the message ‘Here to Help’, the Games Makers will be positioned around the ground between 12pm and 3pm on matchdays, providing a friendly face for existing supporters and those new to watching the Blues. Fans interested in volunteering as Chester FC Games Makers are now being sought and a meeting is being organised to provide further details on the role. Volunteers will receive full training and ongoing support to equip them with the knowledge to assist fellow supporters. Jonny Hughes, Chair of City Fans United, explained more about the initiative. He said: “The Club and Trust have been working closely over the last couple of months to make the overall matchday experience better and this is part of those ongoing efforts. “The Games Makers will be able to provide information and answer general questions, and will have forms to join or renew City Fans United and Junior Blues memberships, and sign up to Squadbuilder, Seals Lottery and other fundraising schemes. “In addition to enhancing the matchday experience, the aim of the Games Makers is to provide better customer service and make it easier for fans to engage with, and support, our club. If you would like to know more about Chester FC Games Makers, or register your interest in volunteering, email jim.green@chesterfc.com or contact the ticket office on 01244 371376. Chester FC and Chester FC Community Trust are asking fans to support those less fortunate this Christmas and donate to the West Cheshire Foodbank. The club will be collecting for in the lead up to the festive period to help those people in our community who are in crisis. Donations will be collected prior to the home matches with Solihull Moors on December 9th and AFC Fylde on December 16th. A donation point will be positioned outside the Blues Bar between 12pm and 3pm for supporters who are able to help feed local families and individuals in need. West Cheshire Foodbank has provided the following list of items it needs most this Christmas: UHT milk, juice, cereal, tinned potatoes, coffee (100g), biscuits, tinned custard, pasta sauce, curry sauce, jams, Cup-a-Soup, instant mash, tinned vegetables, Pot Noodle, tinned fruit, spreads and rice pudding. For further information or to arrange making a donation to the club’s collection outside of the times listed above email community@chesterfc.com. 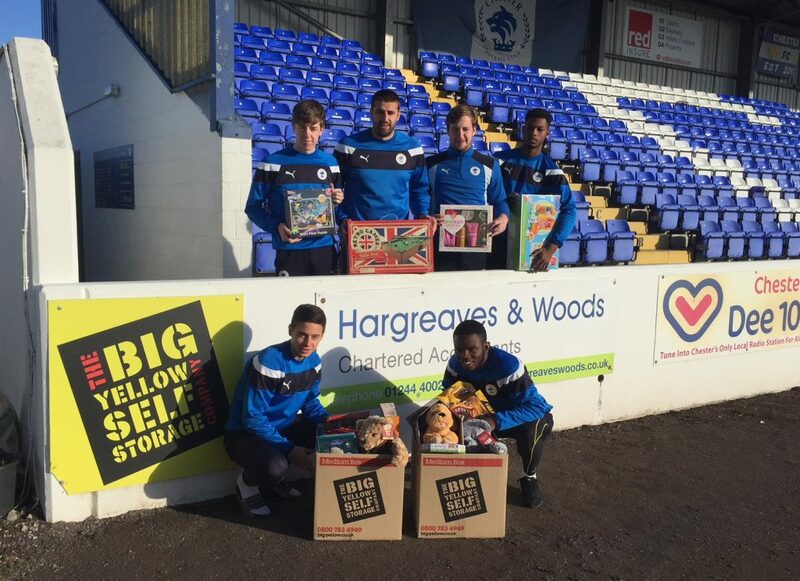 Chester FC and Chester FC Community Trust have once again added their support to the Big Yellow Self Storage Christmas Toy Appeal. The Toy Appeal was launched last month and has already seen a large number of gifts donated which will be distributed to local children and family charities to help put smiles on faces at Christmas. Jeff Banks, business development manager at Big Yellow’s Chester store on Sealand Road, said: “It’s great to have the club and Community Trust involved once again with the Toy Appeal. 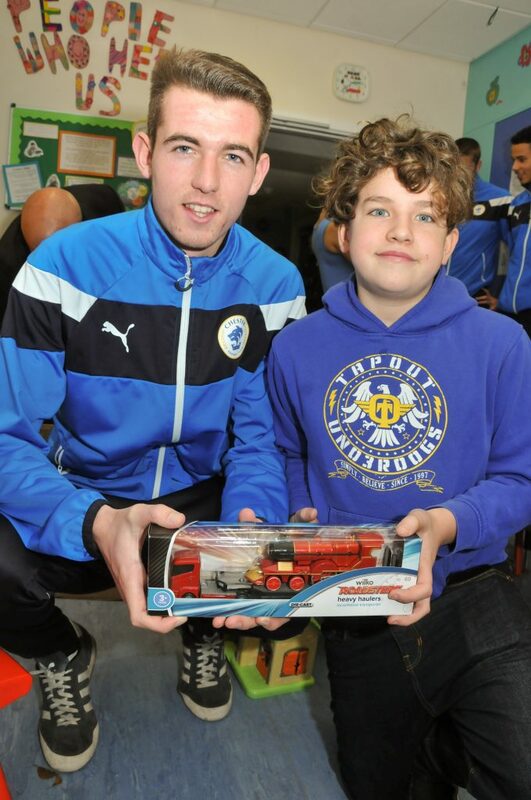 Jim Green, chief executive of Chester FC Community Trust, said “We’re very pleased to be supporting Big Yellow’s Toy Appeal again and I’m sure our fans will get right behind it as they do every year. “Christmas is a special time but sadly we know that for some it can very tough too and this is a small way for us to give something back to our community. Donations can be dropped off at Chester FC’s Swansway Chester Stadium up to and including Tuesday 19th December, before all donations will make their way to the various local charities in time for the big day. Big Yellow Chester are asking for donations of new toys and gifts for ages 0-15, but are also asking for gifts for the elderly too, as one of the beneficiaries of the appeal this year is The Countess Charity, who are looking for donations for both the elderly and the children’s ward. For further information, contact Big Yellow Chester on 01244 399993 or email chester@bigyellow.co.uk or contact Chester FC on 01244 371376.